When was the last time that a band dropped two albums in the space of less than a year and both were exemplary examples of how to bridge genres and make indie pop of the highest caliber? When was the last time you remember that happening, huh? Huh? There aren't enough bands like Ultimate Painting for that to happen too many times. The self-titled debut from the band came out last October and now we've got Green Lanes, due out at week's end on Trouble in Mind. The band is not reinventing the wheel here and that's okay; Green Lanes is like a sort of perfect twin to Ultimate Painting (2014) and that's miracle enough. James Hoare (Veronica Falls) and Jack Cooper (Mazes) recreate that sort of update on the Velvet Underground vibe expertly on the first 3 cuts on this record, most notably "(I've Got The) Sanctioned Blues" which manages to recall more than just Lou and the boys in its Sixties shuffle. The band adds a few other shades to the sound here as "The Ocean" bears a trace of Big Star in its familiar patter. "Paying the Price" even nods in the direction of Pink Floyd, at least the Floyd of that weird-but-wonderful stretch that was post-Syd and pre-Dark Side. That sense of world-weariness is made modern here even as all the trappings are, like on all Ultimate Painting songs, firmly of an earlier era. The addition of drummer Neil Robinson from Mazes is shown to have been a wise choice if one digs the steady beat of the surging "Woken by Noises", a song which has more sense of urgency than some of the other cuts from this group. This is no knock on the tunes here but, rather, a note at how fervid this number seems in comparison. Ultimate Painting sound nothing like the Cocteau Twins but there's a real similarity here in the approach. The Cocteaus had a run of high quality work with a limited palette used to create distinctive music that echoed multiple past touchstones. Ultimate Painting seem to be taking that sort of path. Within seconds of any cut on this album and you know who the band is even if you're going "Oh, that hook sounds like the Feelies!" in your head. It's a jigsaw picture that you enjoy putting together in a different sequence every time. Green Lanes doesn't bear the freshness of the first album from these guys in 2014 but that's no knock on its consistency. In some ways, it's a better record for Ultimate Painting, in some subtle way, sound more assured of what they are doing here. If the first record seemed steeped in nostalgia, then Green Lanes strikes one as more sure-footed and confident. Ultimate Painting have mastered this set of stylistic touches and so there's no need to sort of test out the sound. On Green Lanes, Cooper and Hoare, and Robinson this time out, are wholly confident in their ability to craft music like this, as well as the need for the very same music in question. 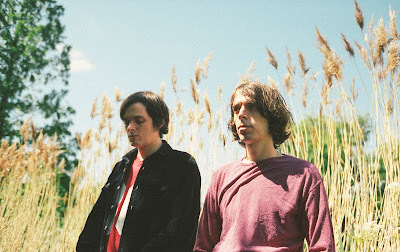 More carefully integrated on this go-round, the new tunes from Ultimate Painting make for one of the most listenable records of the summer of 2015. Green Lanes from Ultimate Painting will be out in a few days on Trouble in Mind Records. Follow Ultimate Painting on their official Tumblr page.